Do you want to know how Arkansas students perform relative to the nation? Do you want to know if Arkansas students are performing at higher levels over time? Look no further than the recently released results of “The Nation’s Report Card” — the 2013 National Assessment of Education Progress (NAEP). The NAEP is a nationally administered assessment given to students in all 50 states and Washington D.C by the National Center for Educational Statistics. The NAEP is administered to a nationally representative sample of students — as schools are randomly selected to administer the assessment. There are various versions of the NAEP — in fact, you can check out many sets of national data here at The Nation’s Report Card website. The most recently released version of the exam was administered to more than 376,000 4th grades and 341,000 8th grade students in math and reading in early 2013. Unlike state benchmark exams which differ from state to state, the NAEP assessments are administered uniformly, with the same sets of test booklets across the nation. Therefore, the NAEP provides an apples-to-apples comparison of students across the United States. NAEP results are probably the best measure we have of how Arkansas students are performing relative to the nation. (Read more about why we–and others–believe the NAEP exam to be the best apples-to-apples comparison in our 2012 blog post). The Nation’s Report Card has an excellent interactive website so that you can examine performance nationally and state-by-state. Additionally, you can examine performance of subgroups of students and compare achievement gaps over time. Check out Arkansas’ overall performance here, and Arkansas’ subgroup performance here. NAEP math and reading scores are reported as scale scores (0-500, with separate math and reading scales) and as achievement levels (advanced, proficient, basic, and below basic). As this particular NAEP exam has been administered since the early 1990s, it is important to examine performance over time. 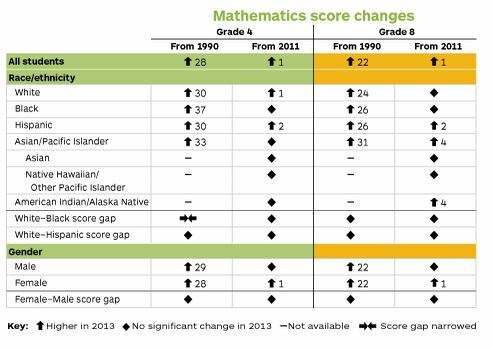 In 4th grade math, the average score is 28 points higher than in 1990 and 1 point higher than in 2011. In 8th grade math, the average is 22 points higher than in 1990 and 1 point higher than in 2011. In 4th grade reading, the average is 5 points higher than in 1992, but the 2013 average is not significantly different from 2011. In 8th grade reading, the average is 8 points higher than 1992 and 2 points higher than 2011. In 4th grade math, the average score is 30 points higher than in 1992 (+2 more growth points than the average), but Arkansas’ 2013 average is not significantly different from 2011. In 8th grade math, the average is 22 points higher than in 1990 (in line with the average growth), but Arkansas’ 2013 8th grade math average is not significantly different from 2011. In 4th grade reading, the average is 8 points higher than in 1992 (+3 more growth points the average), but Arkansas’ 2013 average is not significantly different from 2011. In 8th grade reading, the average is 6 points higher than 1998, and 3 points higher than 2011. In the winter, The Nation’s Report Card will release 2013 NAEP performance data on 12th grade students in reading and math. In recent years, we have released policy briefs examining NEAP scores over time, and we have presented NAEP data to educators, policymakers, and the public across Arkansas. We at the OEP are excited to continue to examine this data, including taking a closer look at subgroup performance, and we will continue to provide updates as we learn more.